So you’re new to yoga and looking for advice on where to begin. Let’s face it, even with the overwhelming sense of inclusivity, the yoga community can be a bit overwhelming to jump into. There's Vinyasa, Power, Hatha yoga, and a dozen other types to choose from. You could take class at a local studio, a gym, have private lessons, or practice at home. What kind of mat should you buy? What poses are safe for beginners? 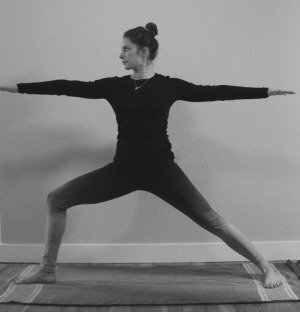 Hatha may not be the perfect style for you, but it is a great place to start. Hatha is gentle, a little on the slower side, and encourages students to focus on proper alignment and form to support their bodies. I’ve designed this 10-minute Hatha yoga sequence for beginners as an introduction to yoga. It will bring your through my favorite poses, give you a bit of challenge, and hopefully be a fun introduction to the practice of yoga. 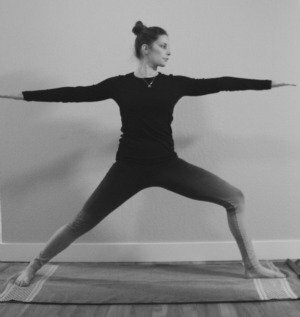 Begin in Mountain Pose at the top of your mat. Take three deep breaths here, giving yourself a moment to arrive on your mat. Stand tall with intention, reaching through the crown of your head. Inhale as you raise your arms toward the sky, keeping your shoulders nice and relaxed. Gently stretch to the left as you exhale. Use your next inhale to draw back to center, then exhale to stretch to the right. 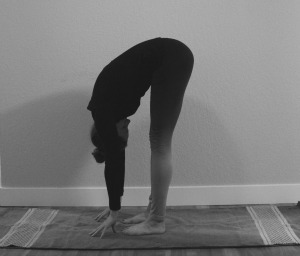 Exhale as you fold forward letting your arms, head, and neck hang towards the ground. Allow yourself three to five breaths to just relax. Keep your knees bent slightly and focus on lengthening your spine. Place your hands on the ground for support as you step your left foot back and release your left knee to the ground. Keep your right knee aligned directly over your right ankle. Use an inhale to lift up tall and lengthen through the crown of your head. Use your exhale to sink forward, releasing your hips towards the ground. Find a comfortable place for your arms, on the ground, placed on your hips, or raised overhead reaching towards the sky. Stay here for three to five breaths. If your hands are up, draw them back to the ground on either side of your right foot. Press into your hands to draw your right foot up and back, coming into Downward Dog. Fingers should be spread wide, heart open reaching back towards your thighs. Your knees should be bent slightly, and sitz bones reaching up towards the sky. Let your head hang heavy and remain here for three to five breaths. Inhale as you raise your left leg up to the sky reaching out through your toes. As you exhale, draw your left foot forward, stepping between your hands. Drop your right knee to the ground and dive your hips forward to find Low Lunge on your left side. Remain here for three to five breaths. Take a deep inhale as your lift your right knee off of the ground. Press into your left foot to gently draw your right foot forward. Release your torso into a relaxed Forward Fold. Place your weight evenly between both feet as you take a deep inhale, rolling up to standing one vertebrae at a time. Let your arms follow, reaching your hands up to the sky. Exhale to release your hands to either side of your body, finding Mountain Pose once more. Take a big step back with your right foot, turning your right toes so that they're parallel to the back side of your mat. 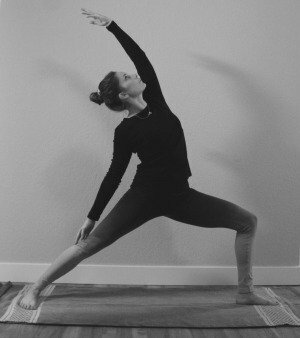 Turn your left toes in, take a bend in your left knee and draw your arms up so that they are parallel to the ground. Settle into Warrior II glancing over your left fingertips. Remain here for three to five breaths. From Warrior II, inhale, dropping your right hand to your right leg, reaching your left hand up to the sky for Reverse Warrior. Reach back to stretch out the front of your body. Draw your arms back parallel to the ground as you straighten both legs. Turn your right toes to face the front of your mat. Exhale as you bend your right knee, sinking into Warrior II on your right side. Take three to five deep breaths, glancing over your right fingertips. Inhale as you draw your right arm to the sky for Reverse Warrior on your right side. To come out, step your left foot lightly to the front of your mat to meet your right foot, releasing your arms to either side. Draw your hands to your hips and find your balance on your right foot, placing your left foot on your ankle, calf, or thigh. Find a place to focus your eyes as you reach your hands up to the sky. Balance here for three to five breaths. Be sure to keep your stomach engaged and maybe challenge yourself by waving your arms gently back and forth. Once you’re finished, slowly release your left foot to the ground and repeat Tree Pose on the other side. 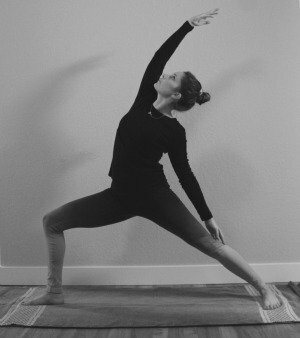 Return to Mountain Pose, feet hip distance apart, hands together at your heart. Take a deep inhale reaching tall through the crown of your head. Close your eyes and take a few moments of mediation. Focus your mind on one simple intention; this can be a word, quote, or even an image. Take this time at the end of your practice to imagine how you can take your intention off of your mat and into the world. End your practice by thanking yourself for stepping onto your mat. This flow can be done once, or a few times in a row. Try to move through the poses slowly and concentrate on the subtle movements of your body. Enjoy the few moments of peace you gain from this 10-minute flow. Most importantly, let your breath be your guide. Your inhale and exhale should move you into, through, and out of each pose. Let’s face it, starting something new is hard. It’s a new challenge, but one that should be fun and invigorating; not stressful or intimidating. This is the beginning of a beautiful new journey in your life. The learning curve will be steep, not only in the physical practice, but in mindfulness as well. Start slow, be patient, and find a practice that makes you happy to step on your mat! How did you begin your yoga practice? How did you feel after your first class? What was your favorite style when you began, and is it still your favorite? Share with us below!